3rd dynasty | Could Joseph and Imhotep have been the same person? The Step Pyramid complex of Djoser contains a dozen shafts that appear to be grain storage bins accessible via tunnels connected to the bottom of the pits and linking to a central open stairwell. 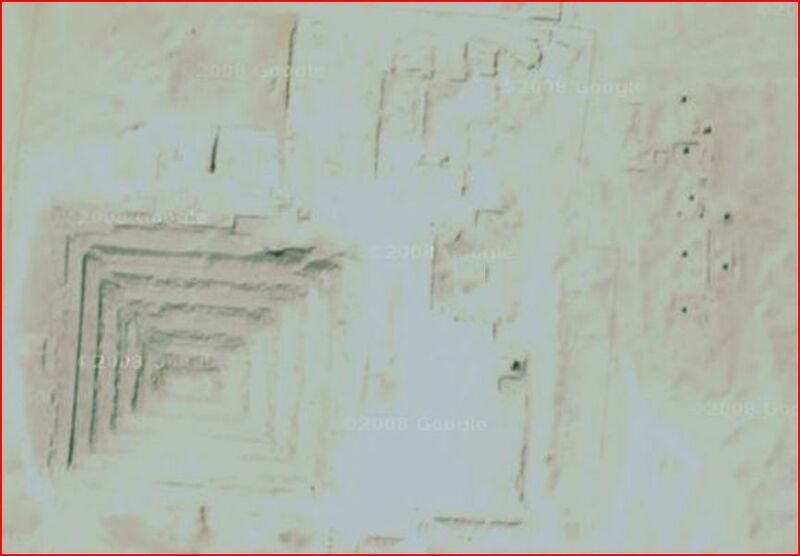 Interestingly, there is a shaft with similar dimensions right underneath the center of the Step Pyramid. The shaft obviously predates the pyramid. Access to the shaft was via a closed in stairwell linking to tunnels around it’s base. It would appear that this was a prototype grain silo. Ventilation would have been a problem and it was likely that it was abandoned as a silo once the better ventilated silos were operational. The abandoned silo was subsequently used as a burial chamber for the Pharaoh when he died in the 5th year of the famine. It was encased with ornate limestone and sealed with a granite slab after the pharaoh’s sarcophagus had been lowered into it. A mastaba was built on top of it using solid limestone blocks. Successive mastabas were added to bury the the Pharaoh’s 3 wives and 11 daughters. The result was the Stepped Pyramid. The pyramids of Egypt remain one of the great wonders of the world. How the Ancient Egyptians managed to cut the huge solid limestone blocks, transport them and lift them into position before the wheel was even invented remains a mystery. The first pyramid to be built was the Stepped Pyramid of Djoser (Netjerikhet) which is part of a complex in Saqqara Egypt that appears to be a grain storage and distribution center. The Step Pyramid itself was built on top of a shaft that was originally used as a grain silo but then converted into a tomb for the Pharaoh. The Step Pyramid is really a series of Mastabas, made from solid limestone blocks, stacked up on top of one another. The Step Pyramid was used to bury Netjerikhet’s 3 wives and 11 daughters and Netjerikhet’s sarcophagus was placed on a platform in the shaft beneath the Stepped Pyramid. The Step Pyramid was designed by Imhotep who may well be the Joseph of the Bible. Joseph and Imhotep have many similarities but have not been thought to be one in the same person because of discrepancies between the estimated dates of their existence. The Step Pyramid became the standard for the burial of pharaohs in subsequent dynasties. Joseph would have lived well into the fourth dynasty if he was Imhotep of the 3rd dynasty and would no doubt have served more than one pharaoh. The great pyramids of Giza far surpass the size of the first pyramid at Saqqara and contain enormous blocks that still leave the experts puzzled as to how they could have been lifted into place with the technology of the day. The 12th dynasty appears to have arisen out of the 11th dynasty based in Thebes which was contemporary with the 6th dynasty based in Memphis. The Middle Kingdom of Egypt, therefore, directly followed the Old Kingdom. There was no First Intermediate Period as such. The pyramids of the 12th dynasty were made from mudbricks that contained straw as a reinforcement. Each pyramid would have contained millions upon millions of these mudbricks which were about 24 inches by 12 inches by 6 inches in size. The 12th dynasty pyramids thus had a core that was made of mud bricks but the outer veneer was made of limestone which was becoming more difficult to quarry by the 12th dynasty and therefore in short supply. Over the centuries, the outer veneer of limestone has fallen down and been pilfered exposing the inner mudbrick core. Paradoxically, the first pyramids to have been built, those of the 3rd and 4th dynasty (Old Kingdom Pyramids), have stood the test of time better than those built in the 12th dynasty (Middle Kingdom Pyramids). This is because the Old Kingdom Pyramids were made entirely out of solid limestone blocks while the Middle Kingdom Pyramids were made largely from Mud Bricks (the core) and only had a veneer of limestone. The pharaohs of the 12th dynasty would have required a large slave labor force to make the mudbricks for the 12th dynasty pyramids. The Israelites had come to number around 2 million by the time of the Exodus. The seven pyramids of the 12th dynasty were built over a 200 year period. Flinders Petrie found evidence of a sudden massive exodus of slaves from the town of Kahun in the 13th dynasty. The town of Kahun was a semetic workers village where the builders of the 12th dynasty pyramids lived. If the Israelite exodus took place in the 13th dynasty then it would seem likely that it was the Israelites who were enslaved during the 12th dynasty and given the task of making mudbricks for the pyramids. After the Exodus in the 13th dynasty, no more pyramids were built. If the first pyramid was designed by an Israelite, Joseph-Imhotep, and the Israelites were slaves in Egypt up until the last pyramid of the 12th dynasty was built, then the Pyramid age would coincide with the Israelite Sojourn in Egypt! It therefore follows that the pyramid age spanned a 400 year period from around 1900BC to 1500BC. The relationship between the Israelite sojourn (430yrs) and the dynasties of Egypt. 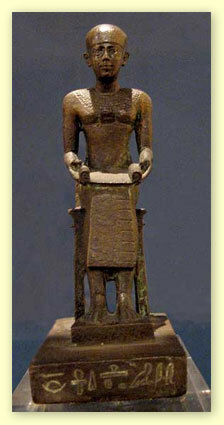 Joseph-Imhotep produced many medical writings and was considered the father of modern medicine. The Greeks regarded him as the God of Healing. Pilgrims in the Ptolemaic dynasty use to bring offerings to Imhotep (mummified animals) hoping to be healed, over 1000 years after his death. Thousands and thousands of mummified Ibis were found in pots in the Ibis Galleries connected to Imhotep’s tomb. The tomb contained an empty sarcophagus orientated to the North. The sarcophagus was orientated to the North indicating that Imhotep did not worship the Sun God ‘Ra’ but rather the God of Abraham, Isaac and Jacob, Yhvh. His sarcophagus was empty because Moses and the Israelites took his bones when the Israelites left Egypt at the time of the Exodus. Who were the pharaohs of the Oppression? The Israelites numbered about 70 when they first came to live in Egypt at the invitation of the Pharaoh whose vizier was Jacob’s 11th son Jospeh-Imhotep. They were allowed to live in the best part of the land; Goshen. Here they flourished and multiplied under the protection of Joseph who was second in charge of Egypt and had saved the country from a seven year famine by storing up grain to sell before the famine started. Joseph had brought up all the land of Egypt and had made the Pharaoh very rich and powerful. Joseph lived until the age of 110 years and served several pharaohs. When he died, he was embalmed and given a royal Egyptian burial – some 80 yrs after he first entered Egypt. The Israelites came to Egypt in the 3rd dynasty when Netjerikhet was the Pharaoh. Pharaoh Netjerikhet came to be know as Pharaoh Djoser as time went by (the pharaoh of Joseph). The Israelites flourished and multiplied during the 3rd & 4th dynasties while Joseph was alive and continued to multiply during the 5th & 6th dynasties after his death. The 6th dynasty, which was based in Memphis in Lower Egypt, was contemporary with the 9th and 10th dynasties based in Herakleopolis and the 11th dynasty based in Thebes. About 100 years after Joseph’s death, a pharaoh who did not know Joseph came to power. Amenemhet I was the vizier of Mentuhotep IV of the 11th dynasty based in Thebes (Upper Egypt). 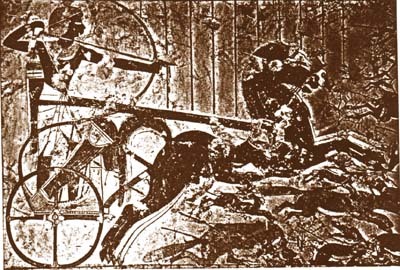 He assassinated Mentuhotep IV of the 11th dynasty and took over both Upper and Lower Egypt to start what is known as the 12th dynasty (or Egypt’s Middle Kingdom). The pharaohs of the middle kingdom did not like the Israelites and felt threatened by them. Fearing that they would join their enemies, they forced the Israelites into slavery. The 12th dynasty pharaohs constructed their pyramids from mud brick with only a veneer of limestone. The 12th dynasty pharaohs needed a large slave labor force to make the mud bricks required for their pyramids. This became the task of the Israelites who by the time of the Exodus had come to number over two million. The 12th dynasty lasted some 200 years and during this time, 7 pyramids were constructed as well as the Labyrinth. The Labyrinth was considered one of wonders of the ancient world by Heroditis. Moses was born during the co-reign of Senusret III and Amenemhet III about 4yrs into Amenemhet III’s reign. Amenemhet III built two pyramids and the Labyrinth. He was very cruel to the Israelites and it was probably he who ordered the midwives to kill the Hebrew baby boys. His daughter Sobeknefru was childless and there was no male heir to the throne. 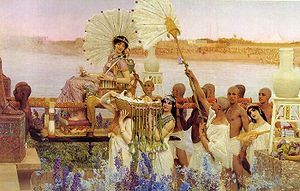 Sobeknefru adopted a Hebrew baby Moses that she found in a basket amongst the reeds of the Nile and she brought him up as her own in her household. He was known as Amenemhet IV. When Amenemhet IV was old enough, 30yrs, he began a co-regency with Amenemhet III. This lasted 9 yrs and then Amenemhet IV suddenly disappeared. This left no male heir to the throne. Consequently, Sobeknefru had to assume the throne but she only lived for 8yrs and then she died. When she died, the 12th dynasty ended and Egypt became unstable. There was a rapid succession of pharaohs in the 13th dynasty. The longest ruling was Neferhotep I who reigned for 11 years. It was Neferhotep I who was the pharaoh when Moses-Amenemhet IV returned from exile. Neferhotep I was the Exodus Pharaoh who chased the Israelites and whose army and chariots were drowned in the Red Sea. Egypt was crippled by the Exodus of the Israelites and became vulnerable to invasion. Not long after the Exodus, the Hyksos, shepherd kings from Arabia, invaded Egypt and built a fort at Avaris. From there, they occupied and controlled Lower Egypt for the next 400years. It was Joseph who set the precedent for Mega Tombs and Monuments for Pharaohs by burying Netjerikhet in a grain silo and stacking mastabas on top of it. Joseph upsized the Mastaba to a Pyramid when he buried his pharaoh in a grain silo. He set the precedent for the pharaohs that followed. Few were able to surpass the solid limestone pyramid that Joseph-Imhotep erected. It was to become the gold standard for the burial of pharaohs in future dynasties.